For reasons unknown to me the developer of PAR Buddy, K. Timmermann, has taken down the program website. The program is unique- its is highly customizable and extremely flexible and it can easily be made portable- the developer has provided official instructions how to run PAR Buddy in portable mode. It is a shame that such a versatile program has been abandoned since it has no real alternatives. PAR Buddy has been mentioned before but hasn't been reviewed yet. PAR Buddy is a free Parchive 2 (PAR2) and RAR client which makes it possible to easily queue and schedule PAR2 checks/repairs jobs and/or unpack RAR files. 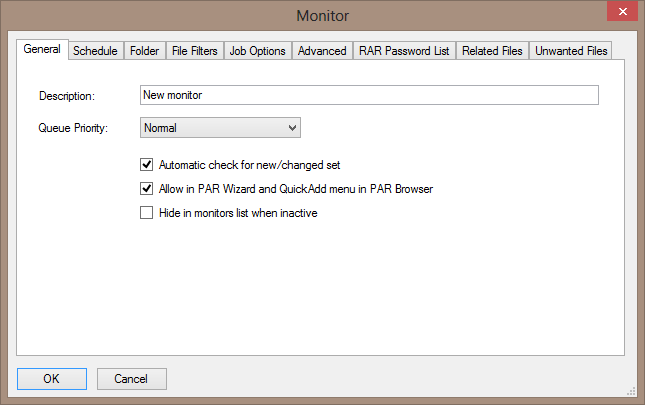 PAR Buddy's most powerful feature is the ability to monitor folders for PAR2 file sets and automaticly perform checking/reparing and RAR file unpacking or moving. If you are already using QuickPAR, PAR Buddy can also work as a great supplement since QuickPAR can be launched manually from PAR Buddy in the rare cases where PAR Buddy is not sufficient for joining files. RAR unpacking with password support. Flexible monitor feature with filters/rules allow to automaticky check/repair PAR sets, unpack or move file, etc. Configurable pop-up notifications with sound effects when jobs are finished. NFO file detection and support for NFO vievers. Copying/moving of related files (configurable). Use SFV files to determine related files (optional). Deleting of unwanted files (configurable). Anti-spam files rules/filters to avoid dangerous files. Option to delete empty source folders. Option to create folder cover image (if available). Display of folder cover (if available). Detailed activity and error logs. Minimizing to tray option and animated tray icon when working. Attractive and intuitive user interface. Supports Windows XP, Vista and Windows 7 in both 32bit and 64bit variants. The developer has provided instructions how to run PAR Buddy in portable mode. The program is fully portable and stealth. PAR Buddy version 2.80 (x32) works fine under Windows 8 x64. PAR Buddy is freeware, meaning it's completely free to use and does not contain spyware, malware, ads, etc. This software is unsupported and without any warrenty - installing and using is at the user's own risk. The latest (and most likely- last) version of PAR Buddy - 2.80, was released on 2011-01-25. The latest version of PAR Buddy - 2.80, supports only PAR2 files. 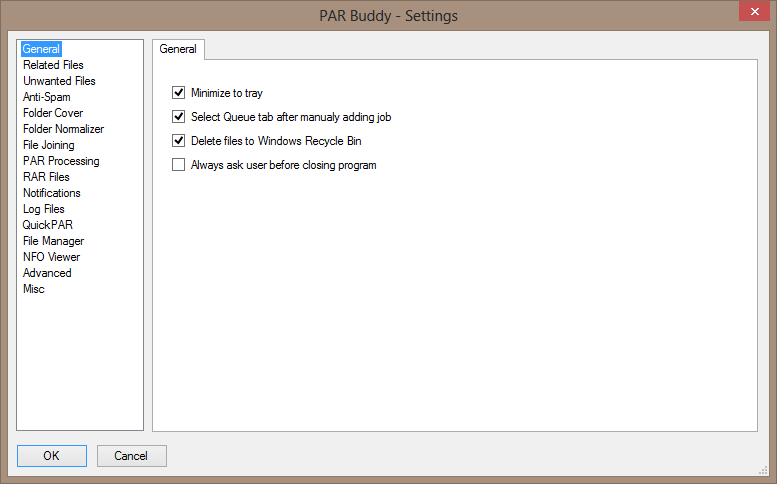 PAR Buddy may be abandoned for good and may be considered legacy software but it is a complex and well-designed tool. As far as I know there is no way to contact the developer. The x64 version of PAR Buddy (PARBuddy280_64bit_Setup.exe) has become the holy grail for me- I searched for it thoroughly but I couldn't find a working download link. I'm a little unclear on the use case for something like this. The folder watch component makes me think that this program is primarily for use with the old (and still around) newsgroups services that embraced the PAR protocol in the early days of the Internet. As connections tended to be rather slow and unreliable, pulling from newsgroups could take days or sometimes a week. Automatically processing these files once they came in was a nice extra. I guess my question is: Who is this targeting? Why use this program over something like Multipar? PAR Buddy is an automation tool- it can be set to monitor folders and queue and schedule jobs- checking, repairing, unpacking, moving.